We just found out this week and I couldn’t wait to share with you that our baby-on-the-way is a . . .
G I R L !!! 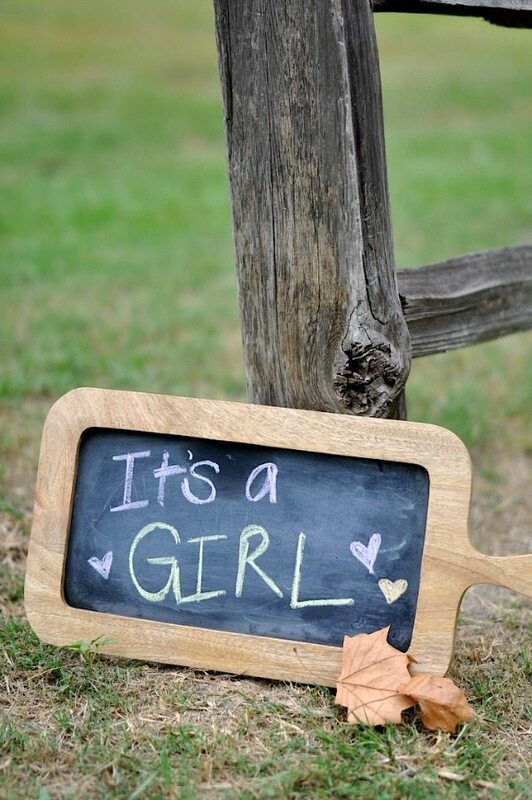 Of course we would be thrilled with either a boy or a girl and just pray that our baby is healthy and strong. She looked perfect on the sonogram and I got to see all her cute little parts and her legs crossed and hands up by her face. Her face! Ahhh, I still can’t believe it! She is absolutely adorable, even inside! Because my husband had to work, I went to the appointment alone and told them not to tell me the gender, but put it in an envelope that we could open together as a family later that night. 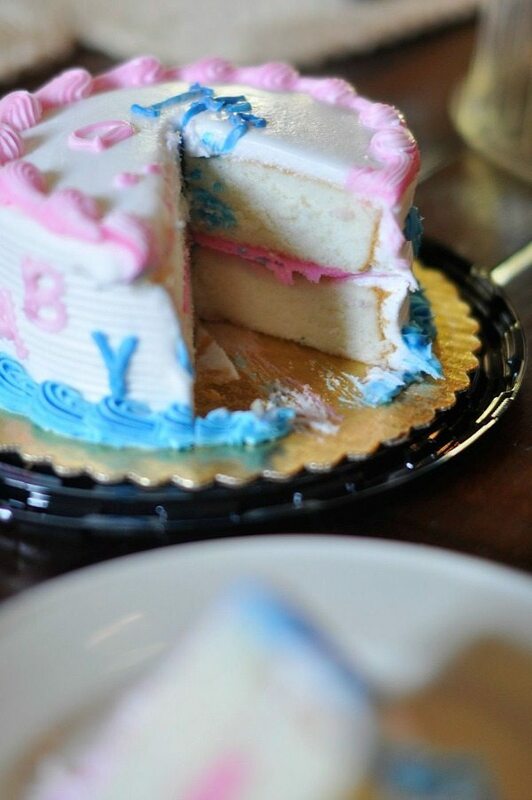 I would have been so tempted to peek, but I really wanted to find out at the same time, so I took the envelope to our local grocery store and had them make a cake with pink icing inside for girl and blue for boy. Given the short notice, they didn’t do anything fancy, but all I was concerned with was getting the icing on the inside correct! 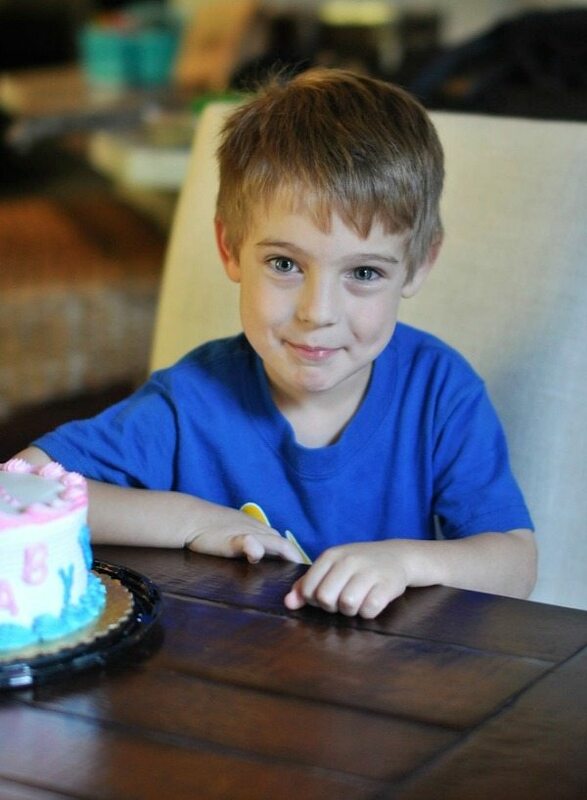 When James came home from school, we told him the surprise inside the cake. Then we let James cut the cake. 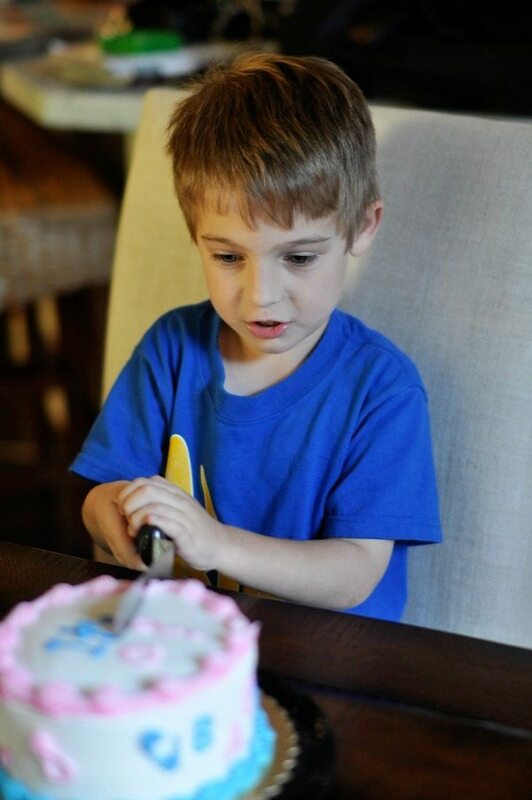 He’s on video saying he hoped it was a brother right before cutting into the cake! She’s gonna love that later! OMG!!!!!!!!!! 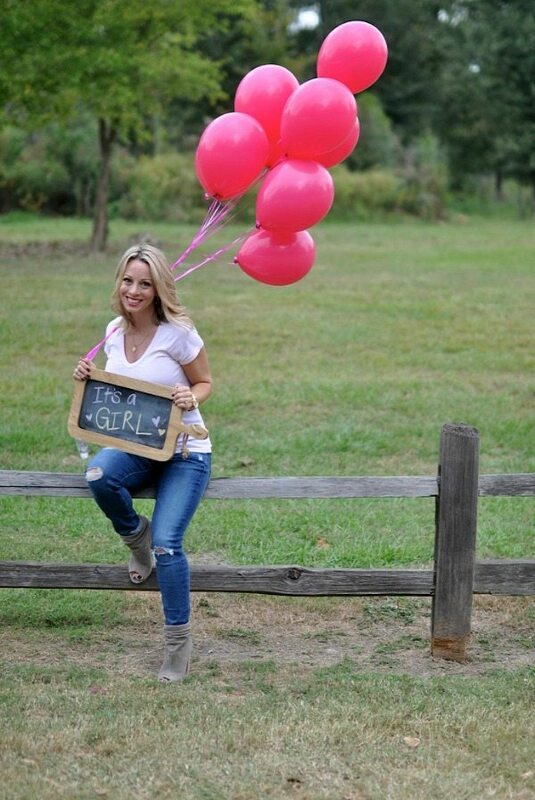 It’s a girl!!! Since the very beginning of the pregnancy, I had a feeling it was a girl, but wasn’t 100% sure. My husband and I are still kind of in shock even now. 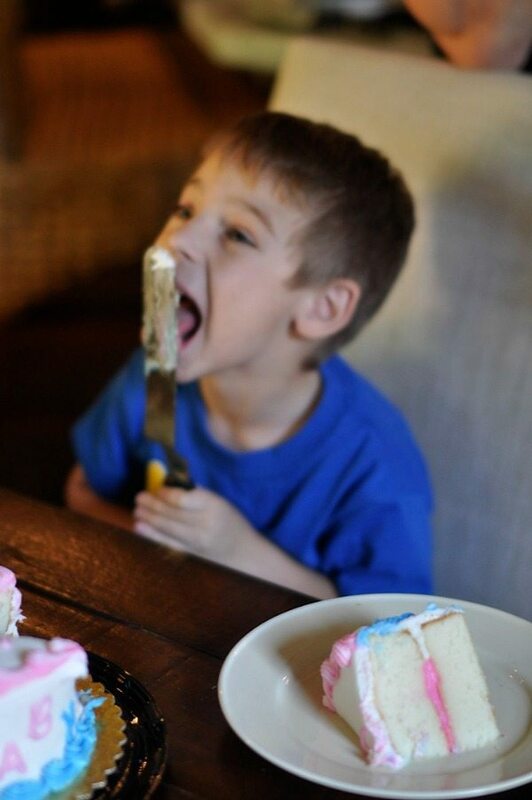 James is just ready to eat cake. The bakery gave us back the envelope with the baby’s picture and the word GIRL clearly spelled out, which I definitely double checked! Later that night, I did a little interview with James about his thoughts on having a little sister. I’m glad I recorded that, will be especially fun to watch later! When I asked him what he thought she would look like, he said she’s gonna have brown hair and peach skin. Loved that! The next day, my Mom came over and we got to take a few fun announcement pictures. We’ve been through a lot this year, so some mother-daughter time to celebrate the soon-to-be granddaughter was so wonderful. We are so happy to share our big news with you! Congrats!!!! 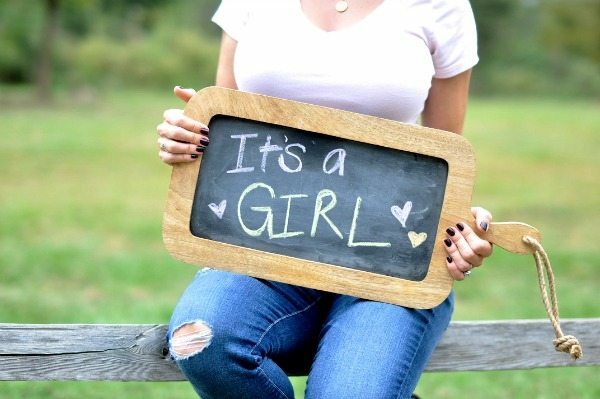 We are having a girl (due March 22nd) and it feels like everyone is having boys right now so I am so excited to see what you find for her!!! Congrats Christi. We have already found a few things. Just couldn't wait. How exciting! You're right though, either gender would have been great, but it is pretty awesome you get to experience being a girl Mom! Congratulations! Thank you. It IS awesome. Congrats sweet momma! I thought it was a girl. Aww, that is so exciting!! Congratulations!!! As a fellow mom of a boy and a girl (in the same order as yours), you will just love getting to experience both genders – both equally special! Thanks Jordyn. Little girl pictures are sure to follow. That is so exciting Megan! Congrats! Congrats! May the rest of your pregnancy be healthy and happy, and may little Miss be healthy too! Thanks Kammi. This we pray. Nothing like a baby girl! Happy for you and your family! Congrats! I think it's nice to get to experience both genders. And of course it will be fun to dress and shop for a girl!!! Thanks Meghan. Fun just thinking about it. How exciting! 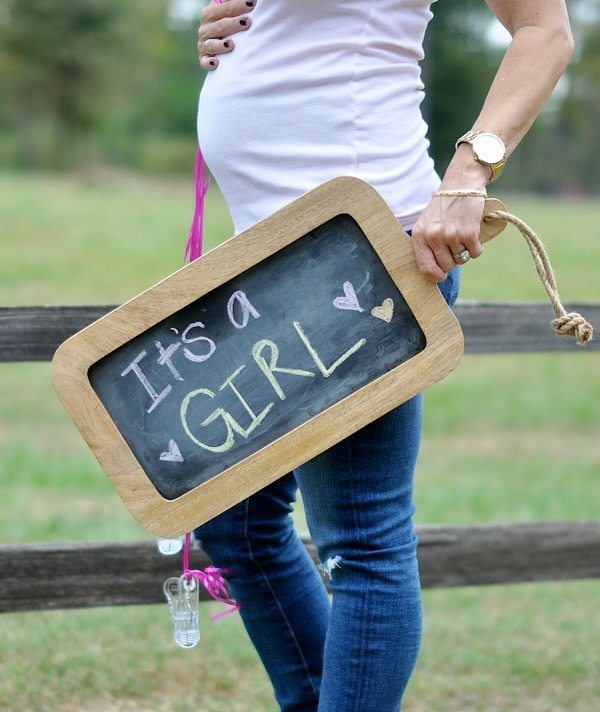 Congratulations on a little girl! Congrats! Girls are the best. I have 2. Not even sure what I would do with a boy. I have a friend at work that finds out what she's having on Monday. So excited!!! Thanks Courtney. I thought about you and your friend on Monday. Boy or Girl? I was a week off on when she found out… but my friend is having a GIRL. Thanks! Yay!!! That's so exciting! Congratulations! What a cute way to find out. Congratulations! Thanks Mindy. We wanted to find out together. Even the lady making the cake had to keep it secret. It was fun. Hooray! Being a girl mom is awesome. It's amazing how much of yourself you will see in her. Thanks Jen. I'm getting a lot of "girl mom" support. So excited for you! I had two boys and my third pregnancy was SHOCKED to find out it was a girl. She totally runs our household now (she is almost 3) and we all just adore her. Congrats!! I don't know you other than through your blog but I am so happy and excited for you. Congratulations and best wishes! So happy for you! Boys are definitely a lot of fun and a little girl just completes the family!! Hi Natasha. Her nursery is in progress and you will see it come together! 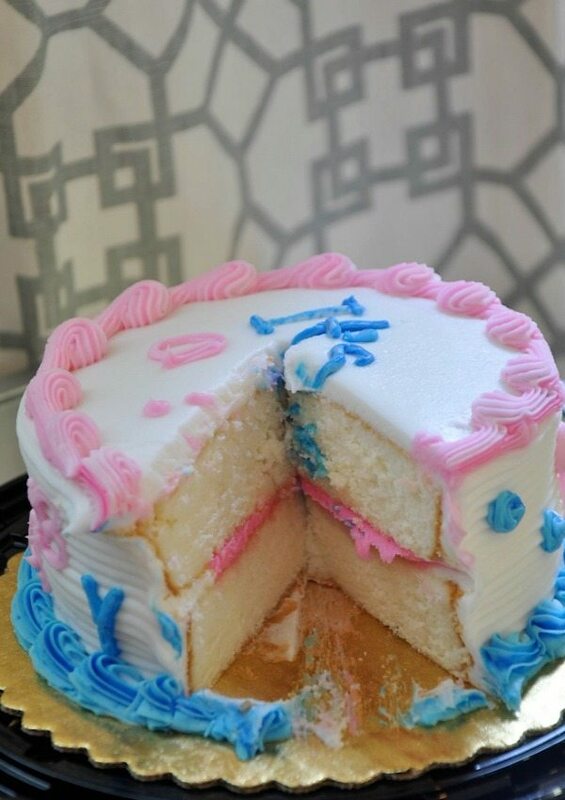 Congratulations on finding our her gender! Thanks for sharing the exciting news with all of us. The excitement on James' face is very sweet. Like you, we would be happy for you girl or boy but now that you know girl, can't wait to see her. You look great by the way. So exciting Megan!! I am thrilled for you and your family. I am glad you had some special time with your mom the other day. I bet this news put a huge smile on her face. James is just the cutest and will be an amazing big brother. I don't have kids but love spoiling my sweet little niece. She'll be a year old already on Christmas Eve. Congratulations! Such a sweet idea with the cake. Congratulations! 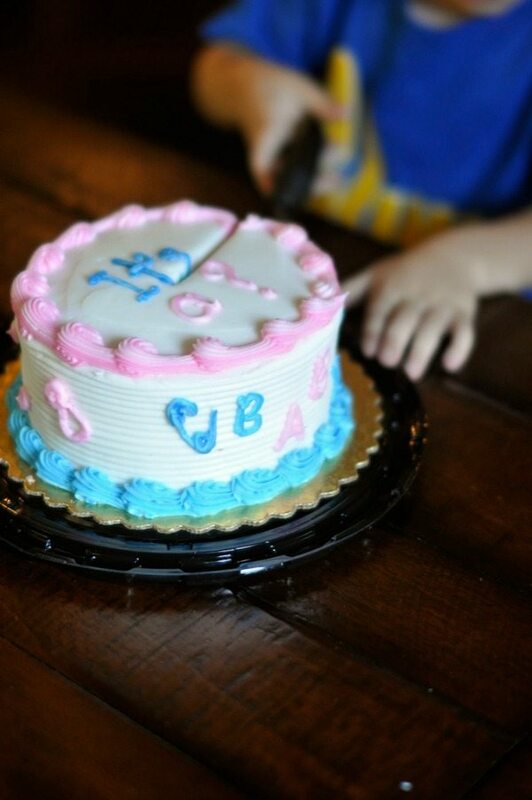 It would have been fun if the bakery made the cake pink too so it would scream IT'S A GIRL!!!! when you cut into it. Congratulations, Megan! 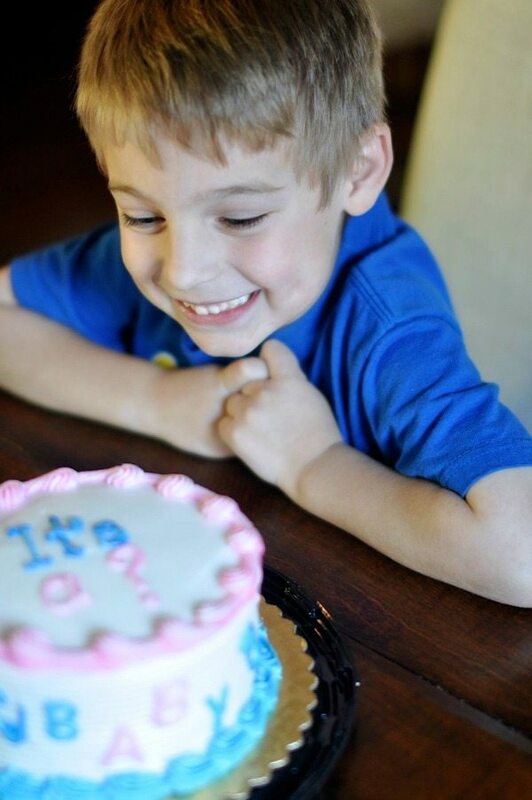 The cake idea was brilliant, and such a fun way to involve your son in the big news! Here's to a healthy little girl lighting up your family's life. Congrats my sweet friend! Such exciting news! Enjoy every single second because it goes by way too fast! Congratulations Megan! Not sure how I missed this super fantastic news last week. You look absolutely gorgeous! Congrats again on your baby girl! Congratulations!!! I jus found your blog and am loving it!! !